Ace DJ Entertainment: founded by High energy Djs! Our 10 year journey began when two Archbishop Ryan High School Juniors DJ’d for a 13th birthday party using borrowed equipment. From there the duo began to sharpen their craft learning craft learning from some of the best in the business. Their commitment to professionalism, quality, and affordability has allowed them to grow to over 12 full time employees servicing everything from DJs to photo booths, to makeup artist and professional photographers and videographers. We provide our clients with the best the entertainment industry has to offer. Below are some of our highlights throughout our 10 year adventure! Triple Ace DJ Entertainment was started in 2002, from three gentleman looking to entertain. Starting at Archbishop Ryan HS the guys had a dream! 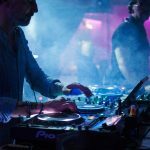 A more focused approach allows the company to grow and gain exposure and recognition for great customer service in the Mobile Disc Jockey and Entertainers Industry. Now fully licensed and Insured Ace DJ Entertainment has a reputation for superior quality at an affordable price. Our growing company can service any event in a multiple variety of ways from entertainment, games, karaoke, lighting and more.